Merry Christmas to everyone, and a happy new year to come. As usual, we’re experiencing wretched excess here. All three daughters are home, everyone is reasonably healthy, and we all get along most of the time. Hope that the same can be said for all 6 of my readers out there. 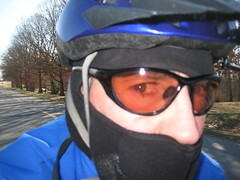 A lovely ride on the shortest day of the year. Now all three girls are home, and I’ve put the lights on the tree. Sophie just got up, so soon we’ll start hanging ornaments. 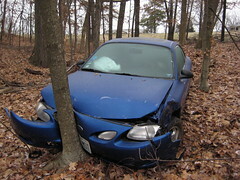 Sophie hit an ice patch on Highway C on Tuesday and went down a hill and into this tree. While I wouldn’t invoke divine intervention, I am very glad that she was lucky enough not to get hurt. The car, on the other hand, is toast. Sadly, certain idiots (me) didn’t make sure that she had comprehensive auto insurance, so it’s a total loss. Aargh. It was so far off the road that the tow truck couldn’t get it out. I just went down this morning with Larry Leimbach, who owns the land, and he pulled it up close to the road with his tractor. A very nice guy. On Monday I’m going to get it towed to the junkyard. Sigh. Nevertheless, she’s fine, we’re fine, Cabell just got home for Christmas, and Hannah is supposed to get in tomorrow. 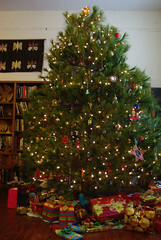 You are currently browsing the Allen Gathman blog archives for December, 2008.